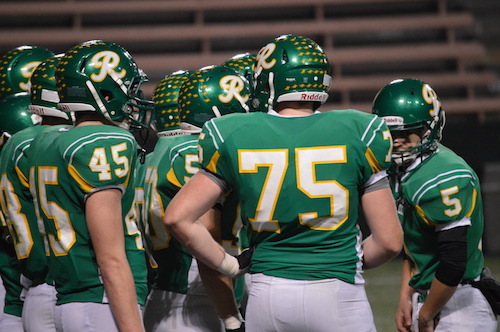 Rivalry night at Ballard HS featured the host Beavers and visiting Roosevelt Rough Riders. These teams are both fighting to maintain their position in the thick of the Metro League standings. 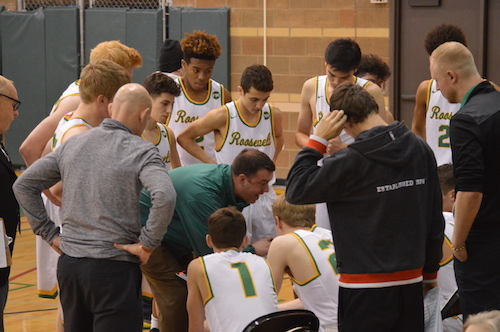 Roosevelt’s precision offense was firing on all cylinders in the early stages of the game working the ball to their number of scoring options including Nick Blume who knocked down eight quick points of his game-high 21. Additionally, the Riders were able to hold the Beavs to only 5 first quarter points. As the first half wore on, Fresh Ausur ignited Ballard who were on a mission to play catch up throughout the ballgame. Ausur attacked the bucket and was able to convert at will. Roosevelt still maintained a healthy lead heading into the second half. When play resumed, Ballard’s comeback continued with Sam Heikell showing his range with four from downtown in the game in addition to more Ausur stepping up. 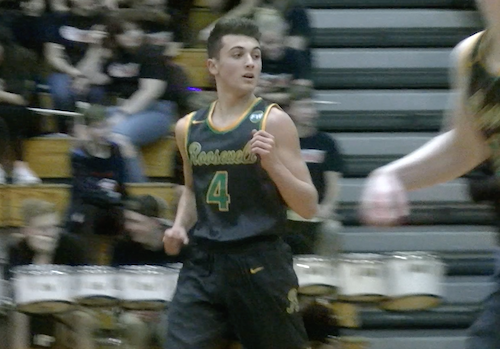 However, as the clock wound down, Roosevelt relied on its senior leaders Thomas Doyle and Clayton Moore to knock down the big shots to seal the deal for the green and gold. In the final Friday night of hoops season before holiday break, a key Metro League matchup featured a Franklin team off to a 5-1 start and Roosevelt looking to keep pace in the standings. The teams traded buckets in the first half of play with neither team able to gain a significant edge. Correy Garrison Jr. showed some razzle-dazzle ball handling feeding leading scorer Maurice Barnett. The guard/wing combo kept the Quakers within striking distance as Marquan Williams faced early foul trouble. The Rough Riders countered with efficient half court executing including several Clayton Moore buckets and spectacular free throw shooting. The home team led 41-35 at the break. When play resumed, Franklin increased their defensive pressure and the effort led to another string of Barnett baskets. Heading into the final frame, the score was deadlocked at 56 apiece. Roosevelt attacked the rim in the final frame and earned numerous trips to the charity stripe where they were an astonishing 29/31 in the ballgame. Franklin ran out of gas and so did the lights in the Roosevelt gym as a blackout took place with under a minute to play. After a 15 minute delay, both teams returned to the floor to finish the ballgame, a solid win for Roosevelt at an opportune time. A windy, rainy Thursday night at Memorial Stadium proved to be a perfect combo for the dominant run game of the Rainier Beach Vikings against Roosevelt. Beach running back Freddie Roberson started his big game early by carving through the Rough Riders defense from 29 yards out to the endzone. Roosevelt’s passing game was shut down by the Viks defense and the run game was also slow out of the gates. The Riders had their chance to even the score when Charlie Bradley & Conor Rowe each hauled in an interception. RB held their ground and Roberson ended the half on a high note with a 34 yard touchdown run. Beach continued to pour down the points like the rain as the second half wore on and the running game continued to chip away chunks of yards. The Vikings defense put their stamp on the game with a fumble recovery for TD and punt block en route to a shutout. 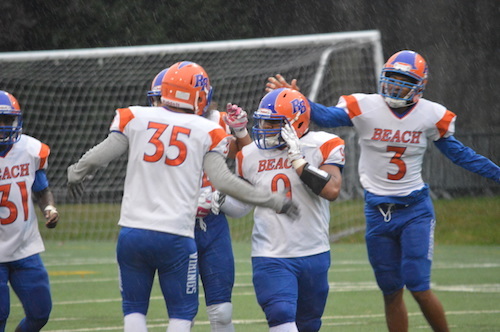 Don’t look now, but Rainier Beach is 7-0 heading into the final weeks of the regular season! 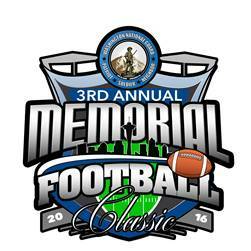 Rainier Beach 34, Roosevelt 0. 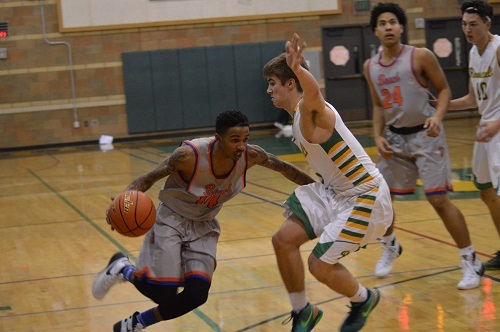 The high-flying Rainier Beach Vikings visited the Roosevelt Rough Riders on Tuesday night for a Metro League contest! Listen as Nic Beckman provides an audio recap of the game! 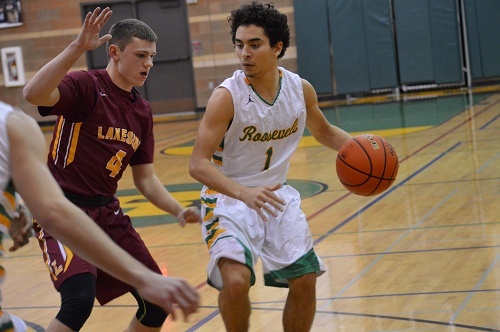 The Rough Riders tipped off their 2015-2016 season with two road games against West Seattle and Bainbridge in which they earned a split. Wednesday night marked their home opener against Mountlake Terrace who was holding a 3-0 record heading into the contest. Metro against Wesco: which team would earn an early quality non-conference win? The first half presented a back-and-forth affair with the lead changing frequently. Mountlake Terrace used their size advantage to clean up on the offensive glass leading to putbacks. As the second quarter progressed, the Hawks hit a cold streak and were limited to only five points in the quarter. Their attempts from three point range were not falling and they had difficulty finishing at the cup. Meanwhile, Johnny Lang sparked a Roosevelt run to start the second frame. The 6’5 senior recorded eight points in the quarter as part of his game high 30 points. The Riders held a 21-12 with 4:21 remaining in the first half and Terrace called a timeout. This felt like a pivotal point of the contest heading into the break to prevent a double digit deficit. The Hawks were able to tread water heading into halftime trailing by eight. They had work to do in the final two quarters. Coach Sood was able to rally the troops and put together a massive third quarter. Eight of the nine active players contributed to their 23 points during that stretch. At the same time, RHS appeared timid and made mental mistakes that turned the ball over. Lang knocked down a pair of three pointers to keep the Riders offensive pulse going during the Terrace run. The game was on a crash-course to an exciting finish. The Hawks trailed by four with thirty seconds remaining in hurry-up mode. Brock Davis drove to the cup on the baseline for a bucket and was off the mark. Fortunately, Derek Anyimah had great post position and was able to come up with the rebound and putback. Roosevelt was fouled on the other end and Nate Suedel missed both free throws giving the Hawks a glimmer of hope. Terrace drove down the court and Davis fired up a three to take the lead. The miss caromed out of bounds with less than a second remaining. Roosevelt simply needed to inbound the ball to run out the clock. The entry pass was intercepted by Joey Gardner who hoisted up desperation three. Good if it goes…off the front of the rim. Ballgame. The Roosevelt bench breathed a huge sigh of relief as they narrowly avoided a late collapse. In the end, the Riders earn a check mark under the win column. In a win-or-go-home scenario for a ticket to the 3A dance, representatives from the Narrows and Metro would duke it out at Memorial Stadium in Seattle. Both teams are far from familiar faces in the state tournament, so each squad entered this game with tangible enthusiasm to extend their season. The stage was set for a clash between the Roughriders and Cougars from the peninsula. Roosevelt’s biggest playmaker Ryan Gleeson tacked on the first points of the game as the senior rumbled for a 40-yard score. CK responded with a touchdown of equal distance to the tune of a Kelsey Deer reception by Kaleb Bates. The pace of the game slowed down as the first half rolled along until the Cougs were able to muster a scoring drive in the final minute before intermission. 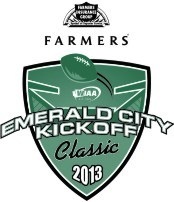 As the buzzer sounded, Kevin White knocked home a 22-yard field goal to put Central Kitsap up 10-7 at the half. The second half quickly turned into a track meet as the elusive Sean Barefield was rewarded with an 11-yard TD run, on a drive that helped move the chains down the field significantly. However, the un-phased Riders scored six on their first play from scrimmage after the kickoff as Gleeson took a Calvin Smith toss over the middle 87 yards to the house. If this wasn’t enough, Smith connected with tailback Noah Gold on a short screen pass at the Roosevelt 21 yard line only to take the rock 79 yards to the endzone after benefitting from great downfield blocking by his linemen. CK wasn’t content with letting go of their lead, so Bates took matters into his own hands by running the ball in from the six yard line for a 24-20 edge. Before the third frame came to a close, RHS was on the move. To open the final quarter, Roosevelt got in the end-zone for their fourth and final time on a 5-yard pass to Jackson Reavis in the corner. However, for the second time in the contest, special teams botched the extra point so the lead was two with virtually an entire quarter remaining. The time would wind down quickly as both teams turned to a conservative run game to set up a finishing move. With three minutes left, CK had their chance. With 85 yards between them and victory, they decided to run on first and second downs with no success. Third down was an incomplete pass and on fourth down, Bates aired it out but the ball was batted away. This allowed Roosevelt to move the chains once and assemble into the victory formation. Riders move on, Cougs hop on the ferry with another season in the books – FinalScore 26-24. To the winner go the spoils in this contest; the 4A KingCo League semifinal matchup between Issaquah and Roosevelt. With a trip to state on the line for the winner, and a horrible draw to reach state for the loser, both teams were fighting tooth and nail for this precious victory. Issaquah started the contest pretty much as well as they possibly could have. A punishing 17-3 lockdown in the first quarter, sparked by great defense and unfortunate finishing by the Rough Riders gave Issaquah a huge momentum boost. The Eagles biggest lead of the game came after another basket to start the second, leading 20-3 and poised for a blowout. But Roosevelt would not back down. They continued to claw back on the shoulders of Nathan Batisti’s 21 points and Cam Haslam’s 16. They closed the gap to just nine entering the fourth quarter, and got as close as six three separate times in the fourth. But the Eagles always answered and it came from an unfamiliar source. Sophomore Trevon Ary-Turner’s previous career high was 16 points against these Roughriders earlier in the season, which concluded in a 12 point win. This time he blew up, scorching Roosevelt from three and putting in an amazing 32 points and leading his Eagles to victory. Issaquah was also unconscious from the free-throw line, making all but one in the fourth quarter to seal their trip to state with a 78-68 victory. Roosevelt will now have to win three straight to secure a spot in the state tournament. The undefeated Garfield Bulldogs (16-0) have had little competition this season. With just one game of their first 15 decided by single digits, the Bulldogs have strolled down the stretch of the majority of their contests, with the game comfortably in their hands. Cameron Haslam and the Roosevelt Roughriders vowed to not make that the case on Friday night. Garfield previously beat the Roughriders at Roosevelt by 21, a game that was decided early in the contest. Garfield jumped out to an early lead in this one too, 8-0 run to begin, allowing everyone to think this would be another Bulldog walkover. Roosevelt clung on to the first quarter after the Bulldog immediate surge, and held right around a ten point deficit throughout the first three quarters. 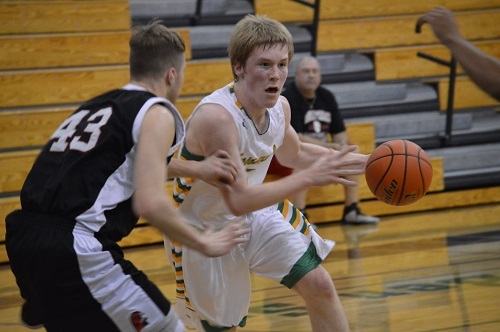 Throughout these quarters, junior guard Cameron Haslam led his Roughriders offensively, scoring 24 points going into the fourth. The Bulldogs won each of the first three quarters and held a 12 point lead entering the fourth. The Roughriders knew that this was their opportunity, their chance to make a dent in the perfect Bulldog record. Their interior defense strengthened, pushing the Bulldogs off the offensive glass and grabbing a few offensive rebounds of their own. The Roughrider offense also began to open up, working to capture baskets closer to the hoop and getting to the line and taking advantage of those chances. The Roughriders found themselves clawing back, down two points with just 2.5 seconds on the clock. Haslam scored another 8 points in the fourth, putting his game high total at 32, but he did not receive the ball in the waning seconds. Instead it went to another Roughrider, who unfortunately traveled on the play and was unable to put up a final shot. Led by Tramaine Isabell with 23 points, the Bulldogs were able to sneak away with just a two point win. 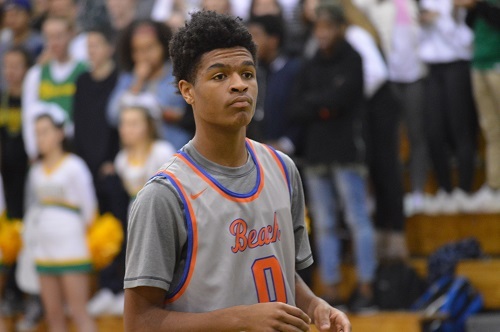 The fifth of eight games on Saturday’s slate of the Rebel Challenge on the main court presented a clash of two 4A squads in Roosevelt and Meadowdale. The Lady Roughriders and Mavericks offer a similar skill set in prominent guard play and effective jump shooting. This game was up for grabs throughout and the team that was able to convert in critical possessions down the stretch earned the victory. Meadowdale established their commitment to challenge Roosevelt early as they created ample scoring opportunities. However, eleven trips to the free throw line in addition to a shooting spree only resulted in eleven points for the Mavs. Roosevelt did not find their groove early, but eight points was enough to keep them within one possession heading into the second quarter. The scoring dropped off in the second quarter for Marcus Merrifield’s Mavericks as only one of nine free throws fell through. Conversely, Roosevelt dropped a pair of three balls en route to a fifteen point second frame. At the half, the Roughriders grabbed a 23-19 lead. Meadowdale entered the second half rejuvenated and prepared to shore up efficiency issues experienced in the first half. The Mavericks drained three triples in a fifteen point third quarter where two of three free throws were good. Roosevelt stayed consistent in the third by notching thirteen points and taking a lead into the final period. This is where the Riders offense fell off in a big way. Their guard trio in Izzy Mason, Serena Toney, and Hannah Swanson account for all of Roosevelt’s nine points in the quarter. Meadowdale saved their best for last as six Mavs scored in the final eight minutes. Ciarra Hart knocked down her third three and Kearstin Franco netted seven in the quarter. MHS’s game-high eighteen point fourth quarter stole the lead and ultimately the win. Final score: Meadowdale, Roosevelt 45. In a primetime Friday night matchup, the Roosevelt Roughriders hosted the favored Garfield Bulldogs in a regular season league game. The Bulldogs came into this contest as one of the favorites to lift the trophy for 4A hoops in the 2013-14 season. Coach Haskins for the Bulldogs knew the strength of his team and elected to start four non-starters, including one freshman and two sophomores. This allowed the Roughriders to win the first quarter 18-14. Once Haskins brought all his typical starters in, the tide began to turn for the Riders. A smothering defensive press by the Bulldogs led to a 21-5 quarter, fueled mostly by seniors Torrence Baker and Lakeside senior transfer Tramaine Isabell. Garfield led 35-23 at the half. With Garfield’s press in full effect in the second quarter and the typical starters still in, the Bulldogs were able to control the third quarter of play as well, dominating the glass and getting easy transition baskets. The final quarter favored the Roughriders, as Garfield brought in their younger players to get some quality league minutes. Roosevelt won the final quarter 23-16, but this game was won by Garfield in the second and third quarters. Garfield won the contest 77-56. The first of two matchups on Leon H. Brigham Field at Memorial Stadium on the first Friday of October featured the host Roosevelt Roughriders and Issaquah. The visiting Eagles squad set the tempo early by completing a 23 yard touchdown strike from Jack Neary to Derek Chapman. Issaquah scored 7 more points a mere 34 seconds later on a 7 yard reception by Jeff Shipley. The Eagles found the end zone one more time in the first frame to take a quick 21-0 lead. The Riders got onto the scoreboard with a 2 yard QB sneak by John Peterson. The efficient passing attack of Issaquah was sustained throughout the entire first half as they notched two more TDs by Shipley again and Tommy Nelson. At the break, the Eagles had a comfortable 35-7 lead. Roosevelt came out of the locker room with a strong defensive game plan which ultimately shut out Issaquah the rest of the way. But the Riders had a lot of scoring to do. With just over 2 minutes remaining in the third Ian Ashbaugh hauled in a pass from Peterson for six. The Eagles defense was stingy in the redzone throughout the game, preventing several first and goal opportunities. 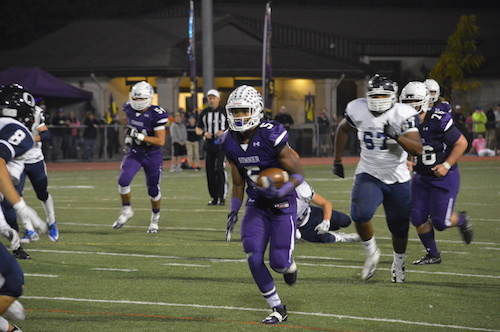 Issaquah’s ability to take a stranglehold of the game early allowed them to control the tempo the rest of the game and ultimately walk away with a convincing 35-13 win.